The King’s architects have surveyed the battlefield as an m columns by n rows grid and have measured the elevation of each square as an integer. 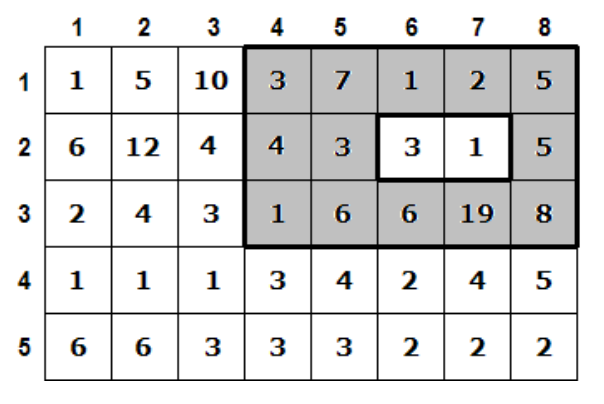 LINE 1: Contains six space-separated integers, respectively: m, n, a, b, c, and d.
NEXT n LINES: Each line contains m space-separated integers that represent the elevations of one row of the grid. The first of these lines represents the top row (row 1) of the grid, and the last line represents the bottom row (row n). The m integers in each line represent the elevations of squares of that row starting from column 1. All elevations are integers in the range from 1 to 100. LINE 1: Must contain 2 space-separated integers that represent the upper-left corner of the base of the pyramid, the first number being the column and the second the row. LINE 2: Must contain 2 space-separated integers that represent the upper-left corner of the chamber inside the pyramid, the first number being the column and the second the row. NOTE: If there are multiple optimal placements, then any one of them you output will be considered correct.